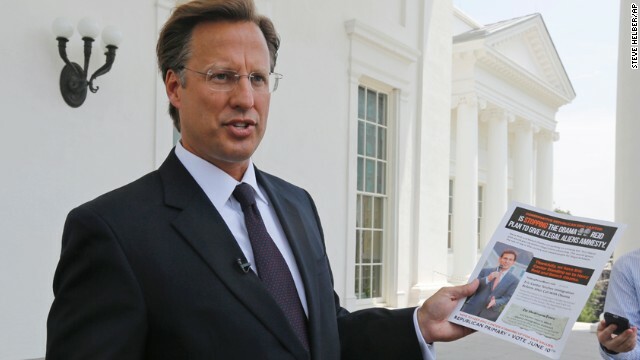 (CNN) - A week after a major primary upset that rocked the Republican primary, Dave Brat, the little-known economics professor who defeated Rep. Eric Cantor, kicked off his general election campaign. CNN caught up with Brat outside his home in Glen Allen, Virginia two days after his primary win. But his remarks Tuesday at a Rotary Club breakfast in Richmond mark his first official public appearance since toppling the majority leader in the GOP primary in Virginia's 7th Congressional District. "Today, we're hitting the ground running, meeting with people across the 7th District," he said, echoing a populist refrain he's repeated since his unexpected win against a Republican House leader. "When we knocked on doors and spoke to thousands of people on the campaign trail, we found that they were eager to send someone to Washington who has a deep understanding of economics and that can actually help to fix the real problems we face in this country." On Monday, Brat's campaign released a video showing the GOP congressional nominee shaking hands with a group of staffers, congratulating him on his victory. Brat also announced the expansion of his minimal campaign staff with the hire of a communications director, Brian Gottstein. Fresh off his unanticipated win, Brat will attend two more events this week in his district - an area anchored in the northern and western suburbs of Richmond but that stretches some 100 miles from the Tidewater to the outer reaches of the Washington exurbs. Brat is now considered the favorite to win the reliably conservative district in November's general election. His Democratic opponent in November, Jack Trammell, also teaches at the school outside Richmond. Donna, every post more ludicrous than the last, lmao, good paying jobs and Republicans, too funny where is evidence of that fox news, ha ha. I'd feel sorry for you but you'd hate me for it.